At Carpet Corner we guarantee your satisfaction. Our reputation for quality, service and value is important to us. If for any reason you are dissatisfied call us and we'll assist you with a prompt exchange, refund or credit. Restrictions do apply. Can I get touch-up paint or stain for my furniture? Touch-up paint or stain is available for many of our styles. For ordering information, please contact our store and one of our trained sales associates can help you. 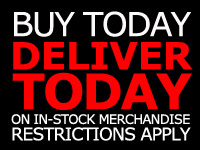 We have an extensive delivery area and many purchases can be delivered the same day! A customer service representative will call the day of the scheduled delivery. Delivery rates start at $45.00 but vary depending on location. It is important for the customer to be home to accept the delivery on the scheduled day, otherwise a redelivery charge of $45.00 will be incurred. All merchandise purchased and delivered from Carpet Cornerwill be professionally assembled at no charge unless otherwise noted. For more details on our Delivery Policies, click on Delivery at top of page. Carpet Corner honors all manufacturers' warranties. Depending on the product, the warranty typically ranges from 30 days to one year. Carpet Corner offers extended warranties on certain products. If you would like more specific information about the manufacturers' warranty on the furniture you are considering, please call us at (773) 927-9500. At Carpet Corner we want you to feel confident about your purchase. We accept returns or exchanges up to 7 days from the day of delivery or pickup. Exceptions do apply. For more details on our Return Policy, click on Return Policy at the very bottom of the page. All merchandise can be held up to 1 year. All store credits are valid for 1 year. After 1 year, all merchandise not picked up or delivered and store credits not used will be forfeited. All returns and exchanges must be in original condition, include all accessories and be in full working order. A restocking fee of 15% of items regular price will be charged on items returned without the original packaging or box. A restocking fee of 25% of items regular price may be charged if items are returned in an altered, unreasonable or abused condition. Your original receipt and proper identification is required for all returns, exchanges, refunds and warranty repair services. It is the responsibility of the customer to inspect his/her merchandise at home delivery before the Carpet Corner Delivery Team leaves the house or before the customer exits the premises of the store when picking up a will call. Carpet Corner reserves the right to deny any return, refund or exchange. Refunds will be made in the same form as original purchase. Purchases made with a check will be refunded in the form of a mail check within 10-15 business days of return. A service transportation fee will be charged for customers requesting the Carpet Corner Delivery Team to pick up a cancelled purchase or exchange. Transportation fees range from $45.00 to $150. For more information, please click on Return Policy at the very bottom of the page. Please visit our Store Locator that will provide you with turn by turn navigation. How long will I have to wait if I ordered something? It may take from one to six weeks depending on the item. In some cases, depending on variables such as fabric, availability, it can take longer. We accept Visa, Mastercard, Discover and American Express as well as most debit cards. What other methods do you offer for payment? We accept personal checks, money orders and cashier checks. Carpet Corner also offers FREE Layaway Plans with easy and low payments. Do you have a mailing list so I can be notified of special sales events if so how do I get on your list? 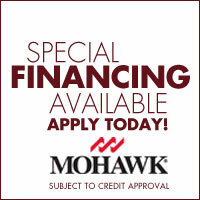 Carpet Corner offers many easy and affordable financing options. No credit, Bad credit, we have a plan for you! 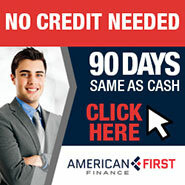 Call our trained credit associates at 773-927-9500 to open an account today! We strive to carry quality brands and deliver your new furniture in perfect condition. If something is wrong with your furniture, we will do everything we can to help you. Often the manufacturer wants to be contacted directly. The manufacturer usually handles part replacements. There will be a note in the literature that comes with your furniture that will direct you on who to call in the event that parts are needed. If this information is not available or if you have any questions, please contact one of our trainedsales associates at (773) 927-9500.All damages, missing parts or issues pertaining to incorrect setup must be reported within 7 days. After 7 days, a service fee of $55.00 plus the cost of parts will be charged. What are some of the store policies on exclusions and non-returnable items? Non- returnable items include all labor, delivery and /or installation charges. Due to Federal Health Law, mattresses and/ or foundations do not qualify for a 7 day return policy once the original plastic is opened. Exchange or repair will only take place if merchandise qualifies, after inspected by a Carpet Corner technician. Stained or soiled merchandise will not be exchanged or repaired. Major Appliances and Electronics that are reported to have a mechanical problem within 72 hrs from the original purchase will be exchanged. Any merchandise reported after the 72 hrs will not be exchanged, it will only qualify for repair. Certain restrictions apply. Carpet Corner will not repair or exchange merchandise with the following signs or damages: accidental or intentional physical damage, spilled liquids, insect infestation, misuse, abuse, altered serial numbers or damage cause by unauthorized repair personnel. All As-Is merchandise sales are final and do not qualify for exchange or return. All warranty is voided. Any carpet or padding that is cut to a specific size or carpet that is soiled , cut or altered from its original size is non-refundable and/or non-exchangeable. All specially ordered merchandise cannot be canceled or exchanged and if customer does so, he/she will be subject to loss of entire deposit. A $75.00 service transportation fee will be added for customers that request the Carpet Corner Delivery Team to pick up a canceled purchase or exchange for a different brand of merchandise!